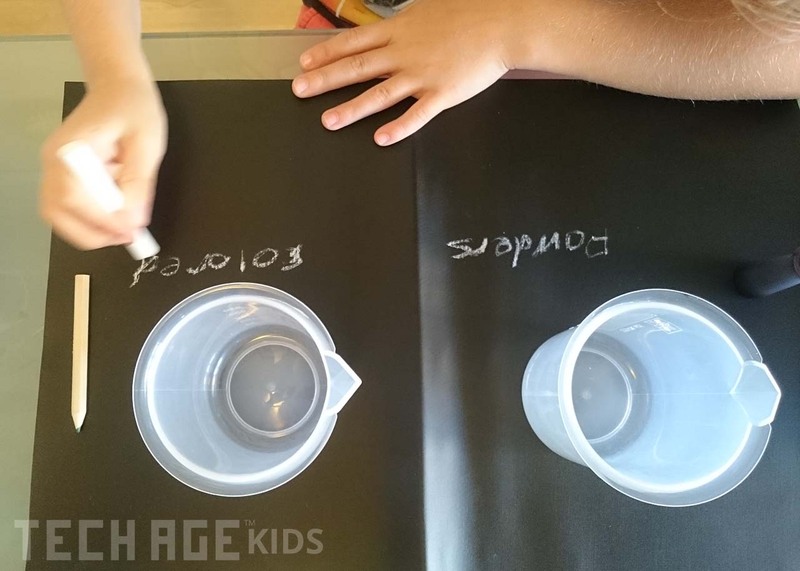 Science based activities are great for kids to explore questions they have about how things work. Children are naturally curious and as a parent I want to capture their enthusiasm about finding out about the world around them. Yellow Scope understands this, and have produced a chemistry kit to get girls excited about science. 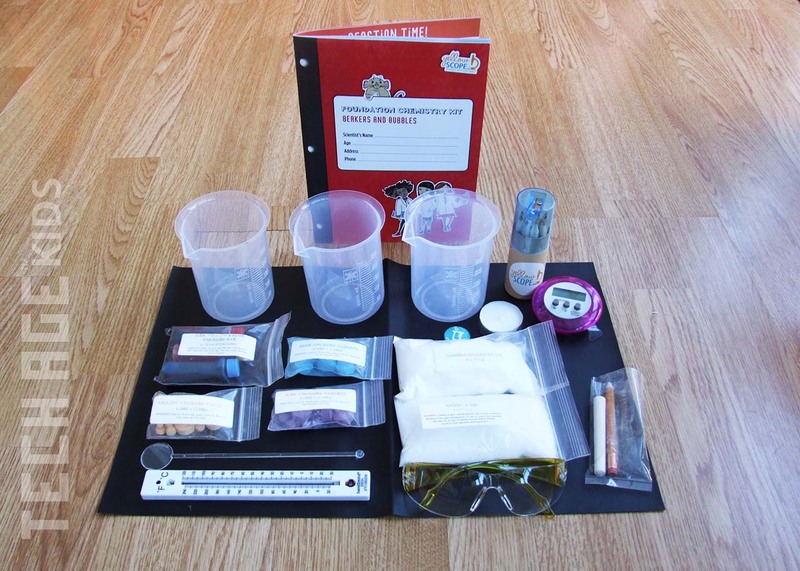 There is currently only one kit available in their store, the Beakers & Bubbles Foundations Chemistry Kit, but we're hoping to see more coming from the scientist-mom duo! 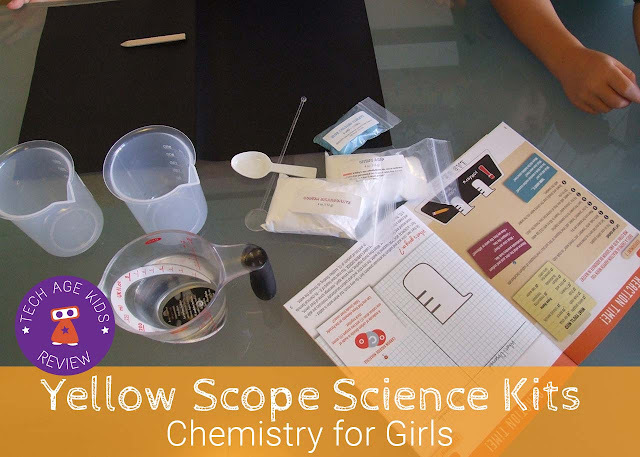 Disclaimer: Yellow Scope sent us The Beakers & Bubbles kit to try out for this review. As always our opinions are our own. The Yellow Scope Science Kit comes in a cardboard box filled with all the substances and equipment you need to complete the experiments. The equipment looks fantastic and definitely made my kids feel like scientists using it. The Beakers and Bubbles kit includes: Lab Notebook (more on this below), Safety Goggles (one set), Three Beakers, Thermometer, Timer, Stir Stick, Candle, Citric Acid, Sodium Bicarbonate, Coloured Dyes, Coloured Tablets, Chalk Cloth (my kids loved this), Chalk, Coloured Pencils & Pencil Sharpener, THINK LIKE A GIRL Pencil and Collectible Chemistry Badge. The Lab Notebook is a storybook, guide and notepad in one. We first sat and read through the experiments, learning about the substances and equipment we'll be using. Like a real scientist, kids can jot down their finding in the notebook. OK, so there is nothing in this box that you can't probably go out and source yourself. But let's be honest who has time for that! As a parent I really appreciated having all the equipment and substances I needed to enjoy a fun afternoon chemistry activity with my kids. Although the kit is marketing "For Girls" the packaging is not overtly "girly" and would appeal to boys too. So the kit is recommended for ages 8 - 12. However, it is definitely an activity that can be done in the family with younger siblings. 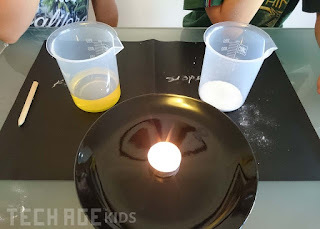 I supervised my 5 and 8 year olds doing the experiments and felt it was perfectly safe for them to handle the beakers and "chemicals" on their own. (Some parts needed an adult, like lighting the candle). We would say 8 - 12 year olds would be able to carry out the experiments on their own - however this will depend on your own child's abilities. The experiments were lots of fun and also invoked a lot of curiosity and what-if questions. We only intended to do the first experiment (Lab 1) during our afternoon session, but ended up exploring Lab 2 and Lab 3 from the Notebook without realising it. The kids were asking things like "I wonder what will happen if the water is hot" or "Can we mix the colours? Which ones will make purple?" We cleared our kitchen table, a glass one (perfect for a lab bench), and set out our equipment and substances. The kids really liked the chalk cloth and even used it to write some of their findings. There was a lot of "ohs and ahs" when our mixtures started bubbling! 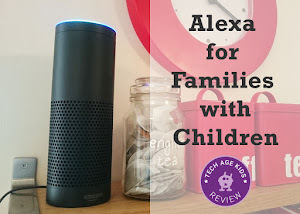 Check out our video below with the kids comments. OK, I'll be honest, my two boys reviewed a science kit for girls. It didn't bother them in the slightest that it said "For Girls" on the box. In fact when we read the stories in the Notebook we changed the words to boys and it left them feeling they too can be scientists and explore their curiosity. So why make a kit only for girls. It's because it is a real problem in the industry. Many of the science kits on the market today are targeted towards boys in the way they are marketed and the packaging. There are lots of initiatives and companies, like Yellow Scope, who are doing their bit to help reduce the gender gap in the STEM industries. At Tech Age Kids, we believe all children should have an equal opportunity to explore the things they are passionate about. Equally boys and girls should have balanced access to any subject they choose, not what the media believes they will like. As parents, we play a vital role in how we shape our kids future. Is it bad to buy your boys a science kit made for girls? Heck No! Similarly, should girls not explore robotics, because most are made to appeal to boys? I agree with much of what you say but marketing anything as being either "for girls" or "for boys" completely undermines the whole premise. In an ideal world that would be completely true. 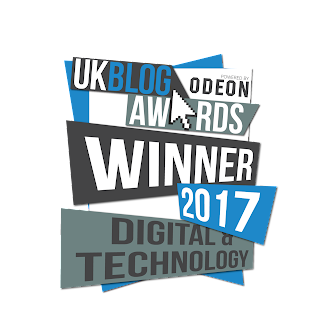 See the article linked in the post for more of our views on the topic. Once buyers habits change then there won't be a need to label a product as "for girls" to reassure them that it really is okay to get this for a girl. There are still websites and stores that separate products into boys and girls and will put STEM toys in the boys aisle so they're not even seen by people buying for a girl. This is changing, but we're not there yet. I have read your linked article and agree with almost all of it, but I still disagree with the above article. Particularly this part: "Is it bad to buy your boys a science kit made for girls? Heck No!". I'd say "heck yes!" and I'd boycott any toy marked as for either gender.I think it is perpetuating the whole "boys toys" and "girls toys" tosh. I bought a chemistry set for my son "Trends Chemistry Lab". Completely gender neutral. Google it and look at the packaging. On the website, the only child shown is a girl. Bottom line - it's a good chemistry set. 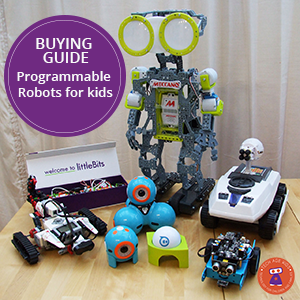 I'd agree with you if people were buying STEM toys equally for girls and boys. 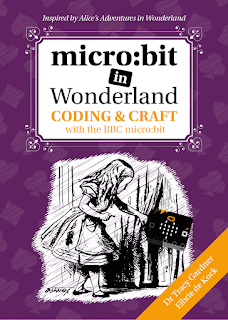 I wasn't bought STEM toys as a child as people didn't think to buy them for girls, sometimes people need a nudge in the right direction. We're moving forward, but we're not there yet. Also there's no way I'm telling my son he can't have LEGO Elves or Mighty Makers sets because they're marketed to girls. That seems worse!